With today's announcement that a 9-month old colt was "found dead due to colic," the terrible toll of horses lost from the ravages of the Calico Complex roundup now stands at 46 (the BLM says 41), more than 2% of the 1922 horses who were so cruelly scavenged from their native ranges. One can only imagine the agonizing death this young horse suffered. If the horse was "found dead," what were the signs that he had colicked? Why did no one intervene to help this colt, or even notice that he was in distress? 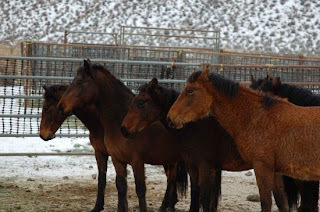 Many of the now 1800+ horses being held captive by the BLM at the Indian Lakes Road facility near Fallon, Nevada are struggling to adjust to their new, enforced diet of grass hay, and we can only brace ourselves as we wait for more to fall.